What is the Not Alone Series? 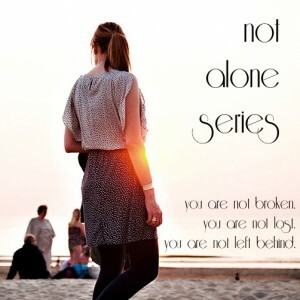 The Not Alone Series was a weekly blog link-up by single women, for single women. In a sea of mommy blogs, we offered a different voice. We shared our joys, crosses, and blessings. We united to remember that we are not alone just because we’re not married. Each week, we posted about a different topic pertaining to an aspect of our lives as single women (mostly Catholic). As we looked forward to whatever might come—marriage, (more) children, religious profession, or ongoing single lives—we had much to say. Jen and Morgan boldly founded the series in 2013. They even appeared on CatholicTV! In 2015, Jen and Morgan passed along hosting duties to Rachel and me. We hosted our last link-up in 2016. We are no longer hosting the blog post series, but you are most welcome in our archives. Use the topics to inspire a post on your own blog! You can also join our private Facebook Group for continuing discussion. What did everyone write about? Check out our thoughts on previous topics using the table below!